My Teenager Gets Great Grades, So They Must Be a Safe Driver, Right? The Myth: Teens who get good grades are safer behind the wheel than those who don’t. To teenagers, a car can be the symbol of ultimate freedom. And whether your child has their own car, borrows yours, or simply bums a ride from friends, if you’re a parent then there’s a good chance you thought about their safety behind the wheel. You may be wondering, do factors like “getting good grades” or not ‘being a partier” more likely to keep your teenager safe? No more speculation or guesses, let’s look at the simple facts. Six teenagers in the United States between the ages of 16 – 19 die everyday from motor vehicle injuries. Male drivers of the same age have a death rate two times higher than their female counterparts. 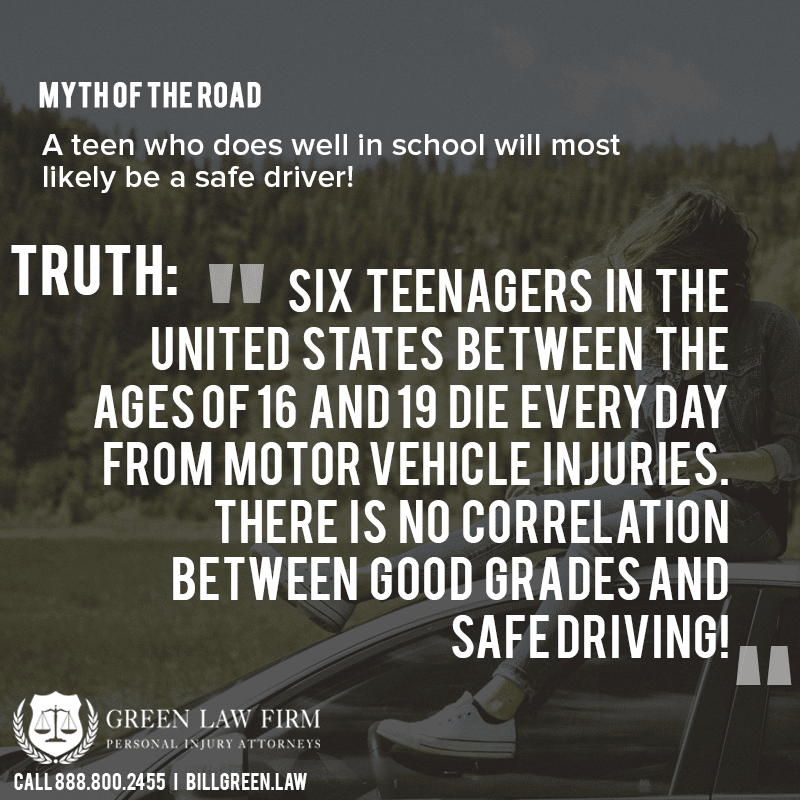 There are no conclusive studies that link teens academic progress in school with their safe driving. So, if getting good grades doesn’t indicate potentially dangerous factors affecting teen drivers, what is? Decision-making ability. Teen drivers are less likely to be able to recognize dangerous situations in the split seconds needed to make critical and life-saving decisions. Seat belt use. In a recent year, only 61 percent of teenagers reported they always wore a seatbelt when riding in the car with someone else. Speeding and tailgating. Especially with male drivers, speed and proximity are huge risk factors. Alcohol and impaired drivers. A recent study suggests that 17 percent of those involved in fatal car accidents had a blood alcohol level (BAC) of .08 percent or higher. Also, 20 percent of teens reported that they had ridden in a car driven by someone who had been drinking alcohol in the past month. How Can I Keep My Teenager Driver Safe? It’s a widely known fact, that you can only control your own driving on the road and, unfortunately, nobody else’s. That being said, here are a few suggestions as to how you might help make your teen a safer driver. – Keep the lines of communication with your teen open and judgment-free. – Require that they drive alone. While they may be disappointed not to be able to shuttle friends around, there are direct studies that link the number of teens in a car to the risk of danger. – Have them share the family car instead of giving them their own. A recent study indicated that teens are more careful with a vehicle if it is not their own; sharing a car reduces accidents by 53 percent. – Limit their driving in bad weather but also use bad weather as a learning opportunity for you to drive with them and show them how to handle situations! – Lead by example. Show them that texting and driving has no place in your car by setting an example! Practice safe driving behaviors from the time they are young to set the standard for their actions. – Consider an app for their phone that blocks texting while driving. Texting and driving is a huge risk for teens! Block texting ability while driving yet still allowing your teen to keep a phone near them in case they get into an accident and need to make an emergency call.